The Citroën Xsara WRC is one of the most successful cars to compete and dominate the WRC, winning 32 races between 2001 and 2006. 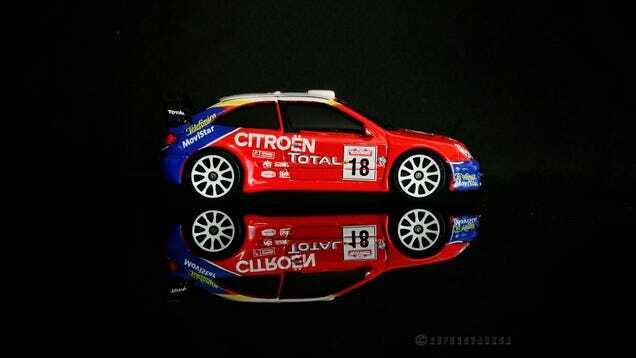 28 of those victories for the Xsara WRC came from driver Sebastian Loeb and navigator Daniel Elena who won 3 straight championships with the car in 2004, 2005 and 2006 with Citroën themselves winning a similar 3 peat as a manufacturer in 2003, 2004, and 2005. Though the C4 WRC replaced the Xsara in 2007, the car continued to be run by privateers until 2009 when Pettr Solberg drove it for a good part of the season (switching to other cars in the 2nd in later parts of the season) and finished 5th in the 2009 WRC Drivers championship. This is a 1/57 scale casting from the Majorette Racing series from 2005-2007.